The Bullet Cluster, located about 3.8 billion light years from Earth, formed after a violent collision of two giant clusters of galaxies. This image combines an X-ray image from Chandra with optical data from the Hubble Space Telescope and the Magellan telescope in Chile. Scientistsare on the hunt for matter?s arch nemesis, antimatter, and new evidencesuggests the search may have become even trickier. The data,collected at a supercluster of galaxies called the Bullet Cluster, show noevidence of primordial antimatter. But the non-finding helps to set alimit on where thewacky particles could be hiding, the researchers say. Antimatteris real. It is made of elementary particles, each with the same mass butopposite charge and magnetic properties as a corresponding counterpart ofmatter. A proton's antimatter counterpart is called an antiproton and that foran electron is called a positron. While thestuff is either not around today or present only in miniscule amounts,scientists say that just seconds after the Big Bang, the universe was floodedwith particles of both matter and antimatter. When the rival particlescollided, they destroyed each other and produced energy (in the form of gammarays). Most of this material annihilated early on. But sinceslightly more matter than antimatter is thought to have existed initially, onlymatter was left behind, at least in the local universe, which includes thestars and galaxies located less than 500 million light-years away. (Onelight-year is the distance light will travel in a year, or about 6 trillionmiles, or 10 trillion km.). There's achance antimatter could have survived in the more distant reaches of theuniverse. Today,scientists are pretty sure of antimatter's existence. For instance, researchhas suggested starsgetting torn apart by black holes and neutron stars can produce traceamounts of antimatter (though it wouldn't stay around long with normal matter nearby).And in the lab, high-energy particle accelerators such as the Large HadronCollider (LHC) could churn out the anti-particles, once the instrument is fullyup and running. Even so, noevidence has yet been found for antimatter remaining from the infant universe. The onlyway to detect antimatter is to look for a certain range of gamma rays producedwhen the anti- and normal matter particles collide. And while scientists havesearched for such energy signatures in separate galaxies or clusters ofgalaxies, this new research is one of the first to probe a smash-up of groupsof galaxies called a supercluster. "Ifthere's any antimatter still around in the universe today, we know it can't befully mixed with ordinary matter in the solar system or the galaxy or probablyin our local group of galaxies," said lead researcher Gary Steigman of Ohio State University. "But the question is, on some bigger scale, could there beseparate regions of antimatter?" Thethinking goes that perhaps regions of predominantly matter and regions ofpredominantly antimatter somehow got cordoned off from each other. These bubbleworlds then could have remained hidden from one another as the universeballooned up big time with inflation, or the theoretical exponential expansionof the universe after the Big Bang. "Ifclumps of matter and antimatter existed next to each other before inflation,they may now be separated by more than the scale of the observable universe, sowe would never see them meet," Steigman said. "But they might beseparated on smaller scales, such as those of superclusters or clusters, whichis a much more interesting possibility." When suchclusters collide, the smash-up would bring the rivals into contact, resultingin destruction of both and a release of gamma rays. 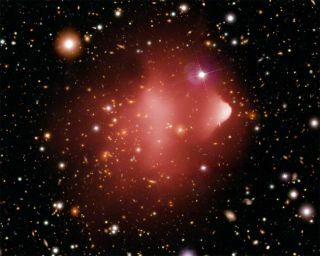 Steigmanand his colleagues chose to study one of the most violent collisions betweentwo large clusters of galaxies, which resulted in the Bullet Cluster. Theresearchers looked for gamma rays by analyzing data collected by NASA's ChandraX-ray Observatory and Compton Gamma Ray Observatory. Officiallyknown as 1E 0657-56, the Bullet Cluster is located about 3.8 billion light-yearsfrom Earth in the constellation Carina. "Thisis the largest scale over which this test for antimatter has ever beendone," said Steigman, whose paper was published in the October issue ofthe Journal of Cosmology and Astroparticle Physics. "I'm looking tosee if there could be any clusters of galaxies which are made of large amountsof antimatter." Theresearchers did not find any gamma rays, meaning the Bullet Cluster containsless than three parts per million of the mysterious stuff. "Thisis the first example on the scale as big as the scale of the colliding clustersthat says there's no evidence for antimatter," Steigman told SPACE.com. "So it pushes the scale on which antimatter could be hiding to even largerlength scales or mass scales in the universe."